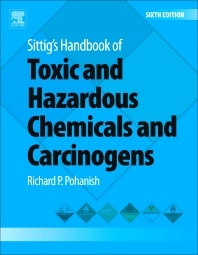 For more than a quarter century, Sittig's Handbook of Toxic and Hazardous Chemicals and Carcinogens has proven to be among the most reliable, easy-to-use and essential reference works on hazardous materials. Sittig's 5th Edition remains the lone comprehensive work providing a vast array of critical information on the 2,100 most heavily used, transported, and regulated chemical substances of both occupational and environmental concern. Information is the most vital resource anyone can have when dealing with potential hazardous substance accidents or acts of terror. Sittig's provides extensive data for each of the 2,100 chemicals in a uniform format, enabling fast and accurate decisions in any situation. The chemicals are presented alphabetically and classified as a carcinogen, hazardous substance, hazardous waste, or toxic pollutant. This new edition contains extensively expanded information in all 28 fields for each chemical (see table of contents) and has been updated to keep pace with world events. Chemicals classified as WMD have been included in the new edition as has more information frequently queried by first responders and frontline industrial safety personnel. Sittig’s Handbook is a globally recognized reference source, providing full listings of the 2,000 most common hazardous chemicals – making it the essential handbook for first-line response to chemical spills and day-to-day chemical plant reference. Entries have a full range of synonyms for each chemical, including trade names, to avoid confusion and enable quick and accurate location of the right information. Authoritative and frequently updated, Sittig provides a fully accurate source of information that engineers and emergency response services look to as a highly dependable reference both for emergencies and day-to-day engineering decisions. All safety and environmental health and safety professionals, including (by job title) industrial hygienists, safety directors and officers, transportation safety specialists, environmental supervisors, specialists, and engineers, safety engineers, toxicologists, union representatives, health and safety technicians, risk managers (insurance), compliance officers in corporations and government, plant or facilities managers, production supervisors, human resource specialists, workers' compensation specialists, attorneys, chemical manufacturers and distributors (including writers and editors of material safety data sheets), waste disposal specialists, health care professionals including industrial nurses and physicians, and first-response personnel including paramedics and firefighters. Richard P. Pohanish is the author or co-author of more than twenty books in the environmental health, safety, chemistry, and engineering fields. Active in the information and publishing business for almost half a century, Mr Pohanish is president and publisher of Chem-Data Systems and author of Sittig's Handbook of Toxic and Hazardous Chemicals and Carcinogens. Richard P. Pohanish is president and publisher of Chem-Data Systems and author of Sittig's Handbook of Toxic and Hazardous Chemicals and Carcinogens.